Know you’re getting a superior clean* with the Oral-B Genius 8000 electric toothbrush. 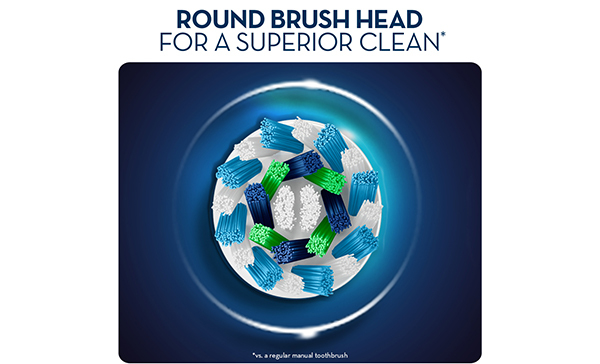 This highly advanced brush features a dentist-inspired round electric toothbrush head that surrounds and cups each tooth with dynamic oscillating, rotating and pulsating movements to remove up to 100% more plaque than a regular manual toothbrush. Oral-B Genius 8000 Electric Toothbrush incl. 3 Brush Head Refills & Travel Case is rated 4.6 out of 5 by 56. Rated 5 out of 5 by Greeneyedgirrl from The best toothbrush I’ve had in a long time I read the reviews, I’ve always Oral B electric toothbrushes they have always lasted and cleaned my teeth fantastic. The last oral B I had was 5 years ago and it is STILL working well! I wanted to upgrade though to a bit more powerful model. I’ve given my old one to a family member. This model the Genius 8 is FANTASTIC. I have seen a dramatic improvement in my gums, and my teeth feel so clean. I love the red light that tells me if I’m pushing too hard, and the different multi speeds/modes of clean. Cannot go wrong with this model. I love it. Shaved shop was prompt with delivery. Well done on the delivery. Thank you! Rated 5 out of 5 by Gums from Has helped me with healthier gums I have been using electric toothbrushes for decades and have typically avoided higher rotations per minute models for fear of enamel thinning or erosion and also gum damage. This toothbrush has some smarts to indicate too hard brushing. Comes with a travel holder although I should have read the fine print where the rechargeable travel holder comes with the Genius 9000. The camera, phone, brushing positioner capability is great for those who want to work on spending adequate time in problem areas. There is also a data logging capability which is good for folks who want to track their brushing discipline. Overall, great product. Rated 5 out of 5 by Estelle from Smart brush I have been using Oral B electric toothbrushes for many years, so for me this is an upgrade from the Triumph series. The Genius uses bluetooth to link to a mobile device to record brushing habits. It also prompts other activities to support oral hygiene (such as flossing and rinsing), and provides a way to track patterns of brushing. One of the great things about electric brushes is that they can be shared within the family, as long as we all have our own brush-heads. While the brush and app are pretty clever, they do not distinguish between my use and my daughter's use, meaning that all our data is combined instead of shown separately. Still, that's a small annoyance. Overall the brush is great. Rated 2 out of 5 by pierre from just an other toothbrush I bought this toothbrush as the old one (also an Oral-B) finally died after many years of use. This model (the 8000) has 5 brushing modes (the old one had 4) with led display and a led collar. it also comes with a phone app and phone holder that acts a bit like the smart-guide used to (visual timer, etc..). They all useless gimmicks, like with the old model, I just use the standard brushing mode every day. I'm a bit disappointed that I could not pair the old 'smart-guide' with this model. The main reason I purchased this model was for the Lithium-Ion battery. Rated 5 out of 5 by jaejk from Options Galore Very easy set up and options for what ever your teeth cleaning needs are. attaching the Toothbrush via bluetooth to ur phone is amazing to record results, brush times and map out how to best clean your teeth and gums without missing a spot. A long lasting battery and sturdy design make for a solid feel in the hand. Options options options, to change the coloured lights and brush setting and even what you want your oral health goals make this an amazing tool for clean and healthy teeth and gums. Rated 4 out of 5 by Teddy from Excellent Clean, great features I bought this to replace my aging Oral B Electric Toothbrush. Great replacement and would recommend to anyone. I didn't think I would use the bluetooth feature, but I have a number of times. It isn't perfect but pretty good. Would give 5 Stars but I would have liked a timer on the handle like my old one. And also, I thought the travel case was a chargeable case but that is purchased separately and is pretty expensive. My fault, should have studied it more but still disappointed. Rated 4 out of 5 by Lee-Anne from Seems very good so far I have only used this a couple of times since receiving it yesterday. It all goes together well, but... the replacement brush heads are not labelled, so you have to look up the website to find that they are sensitive, cross action and floss action heads. The instruction leaflets do not tell you what the different settings are, only that it has the different settings. So it is a good product, but has poor support out of the box for new users. Rated 5 out of 5 by JSF 11 from Amazing I purchased this toothbrush 1 month ago and absolutely love it. Not only is it fantastic on my teeth but also super fun to use. Who thought that brushing your teeth could be so much fun. The app gives you challenges, allows you to read the latest news and also gives you cool filters to use. Easy to use & amazing quality. Shipping was a littler longer then I would have liked so that is something that I think could be improved on.